Lucie & Simon are a self-taught artistic duo living and working out of Paris, France. 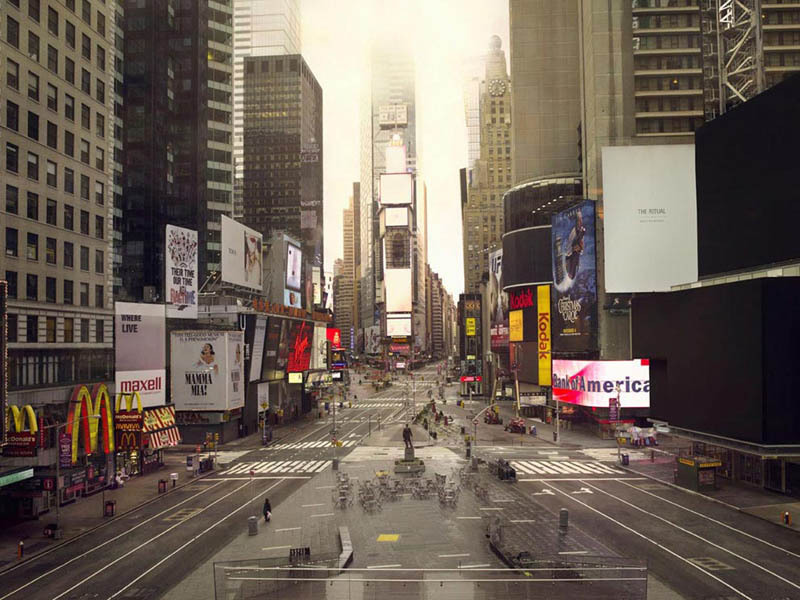 In their post-apocalyptic series entitled Silent World, the artists empty famous places in major metropolises like New York, Paris and Beijing. In each striking capture lies a symbolic character that brings a narrative feeling to the image. The haunting photographs were created using a neutral density filter that allows for extra-long exposures, which removes moving objects like people and cars. Below you will find a small selection of this fascinating series. To see all 30 photos in large full-screen format, be sure to visit Lucie & Simon’s official site. There is also a 7-minute short film at the bottom of this post which sets the Silent World images to music. It certainly adds to the whole experience and is worth checking out. Littered below you will also find various excerpts from interviews found on their website. Enjoy!